It’s been a long time since I’ve had a Writer Wednesday, which features writers I think you should know or shares tips and information about writing and publishing. I’m excited to have one today. 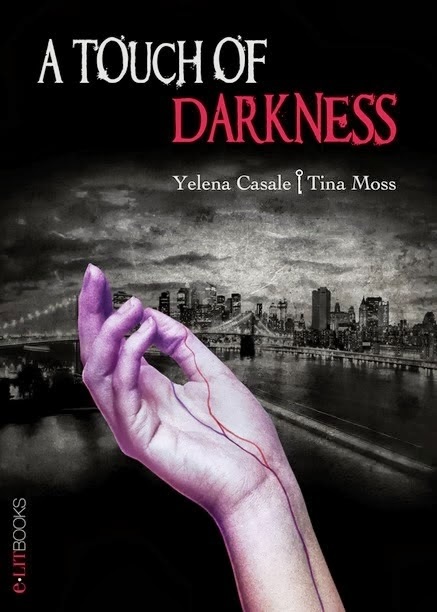 Please welcome Yelena Casale, who has written a guest post for us as she and co-author Tina Moss celebrate the release of their new novel, A Touch of Darkness. When we sat down to write an urban fantasy novel, we both agreed that we wanted to explore the angel and demon mythology and find new twists in it. We wanted to leave the religious aspects out of it and create a whole new variation that would hopefully surprise those that thought they knew everything about it. I was always fascinated with this particular mythology and with angels in particular. Of course, when one thinks of angels, usually they think of unbelievably beautiful beings that are the protectors of humans, and who are the servants of God (that is true for most religions). They may think of pictures of guardian angels watching over little children, and even as the messengers of the supreme being. Few others will remember that angels can also be warriors, fighting for the good of humanity and against the evil forces. This image is darker, more dangerous, frightening even. Archangel Michael with his flaming sword inspires awe and respect. And who can forget the first, the most beautiful angel of them all, the ultimate fallen angel – Lucifer, who now inspires nothing but fear and personifies evil. Lately, there has been an explosion of angelic mythology in urban fantasy and paranormal romance literature, as well as TV shows. As a matter of fact, Supernatural is a TV show that is steeped in angel and demon mythology for many seasons now. One of the aspects that it explores is what if angels are not the perfect beings of utter kindness and mercy? What if some go bad? What if some are to be more feared than admired? Certainly, one of the main attractions of urban fantasy is the myriad of ways to explore mythology and find innovative twists on it. As we say, in urban fantasy, anything can happen and the most amazing creatures can exist alongside humans. Just open your mind and delve deep into your imagination. It’s a fascinating world.